Trondenes Church (Norwegian: Trondenes kirke) is the northernmost medieval stone church of Norway and the world's northernmost surviving medieval building. It is a parish church of the Church of Norway in Harstad Municipality in Troms county, Norway. 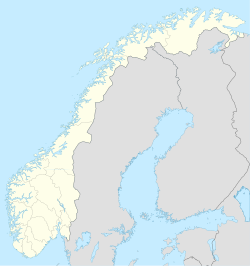 It is located on the northern edge of the town of Harstad. It is the main church for the Trondenes parish which is part of the Trondenes prosti (deanery) in the Diocese of Nord-Hålogaland. The white, stone church was built in a long church style around the year 1435 by an unknown architect. The church seats about 300 people. Though frequently referred to as a 13th-century church, dating based on dendrochronology places its completion shortly after 1434. Compared to the other ten north Norwegian medieval stone churches, Trondenes Church is well preserved, the exterior condition still close to the original state. The nave is 22.6 metres (74 ft) long and the chancel is 13.5 metres (44 ft), making it one of the largest medieval churches of rural Norway. In the late Medieval period, Trondenes served as the main church centre of Northern Norway. The church is best known for its rich decorations, including three gothic triptychs, one of which was earlier attributed to the German Hanseatic artist Bernt Notke, although modern art historians now doubt the attribution. The baroque pulpit is equipped with an hourglass to allow the minister to time long sermons. The organ dates from the late 18th century. In the choir section, one can see remnants of medieval frescoes. The church is presumably the third church on the site, the first stave church being built in the 11th century, followed by another in the 12th. The second church was fortified with stone walls and ramparts, remnants of which can still be seen around the church today. The church bells once hung from a turret but, as the turret has long since been demolished, the bells now ring from a small tower in the graveyard. ^ "Trondenes kirke". Kirkesøk: Kirkebyggdatabasen. Retrieved 2018-07-28. ^ "Om Trondenes kirke" (in Norwegian). Den Norske Kirke (Church of Norway). Retrieved 11 November 2016. This page was last edited on 29 July 2018, at 03:58 (UTC).